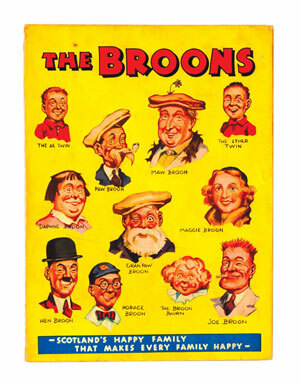 THE BROONS BOOK 1: £4,500 - TRIGAN EMPIRE A/W £1,650 - LION 1955 In 2 Bound Volumes £715! Scotland's Happy Family was even happier in June when their first book from 1940 made £4,500, a thousand pounds above its upper estimate. 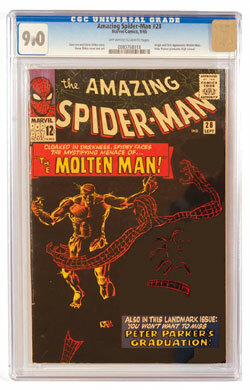 This was one of the best copies to come up for auction and the small piece of top spine that was missing did not deter the successful bidder. Don Lawrence was an artist who was much admired for his work on The Trigan Empire and his back page colour episodes, serialised in Look And Learn, were one of the main reasons for that magazine's collectability. 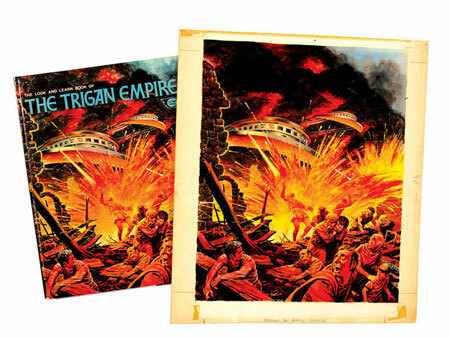 The fact that this artwork piece was used for the front and back cover of the hardback Trigan Empire book makes it one of the most recognised illustrations of his work and the successful bid of £1,650 for this iconic piece has delighted the purchaser who will no doubt be driving his picture framer crazy as we speak! Frank S Pepper's Captain Condor was flying high when Lion's complete 1955 year in two bound volumes was bid to a gravity defying £715. These particular issues mostly had 'Pepper' written in pencil on their front covers - even the great man had to do what was common for the rest of us; order his copy from the local newsagent. 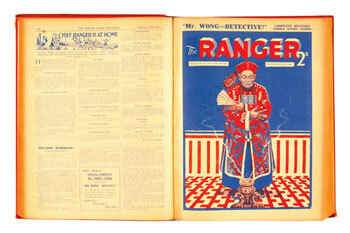 The Ranger and the Thriller were two magnificently illustrated titles for their day, their evocative covers with stories of mystery and dark deeds capturing a Thirties generation whose wanderlust may well have been limited to the front row of the local Roxy. 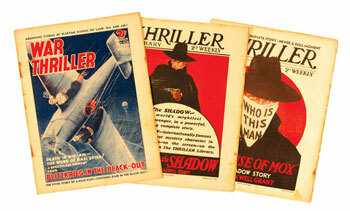 Our 1935 Ranger volume included the last issue and made £203 whilst The Thriller lot, starring The Saint and The Shadow, also included its last eleven issues (retitled War thriller) and captured £385. The war years Beanos are always highly prized as they are genuinely rare and contain the sort of propaganda that crosses over to collectors interested in the social history of that period. Their 12-year-old readers, however, were much more interested in seeing Addy and Hermy defeated by Lord Snooty and His Pals on a weekly basis, especially if Hermy fell over his medals getting out of the plane. 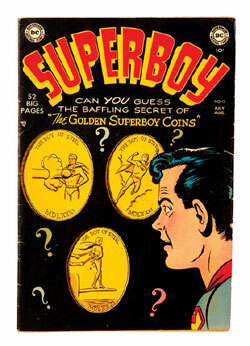 We offered issues from 1941 in groups of two and three per lot as grades were low and varied between Poor and Good. They realised between £72 and £166 per lot accordingly. 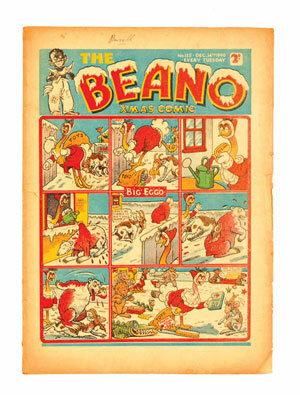 The 1940 Beano Xmas Comic was bid to £220 in Very Good Minus condition. Just like Big Eggo, a very rare bird. 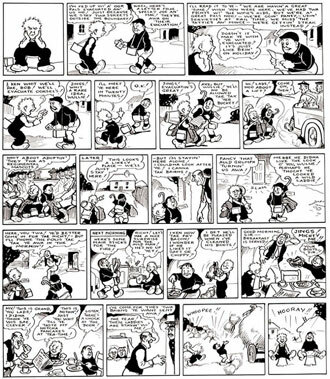 Oor Wullie was also frettin' during The War. All his chums except Fat Bob had been evacuated to the countryside and they wanted to go too. 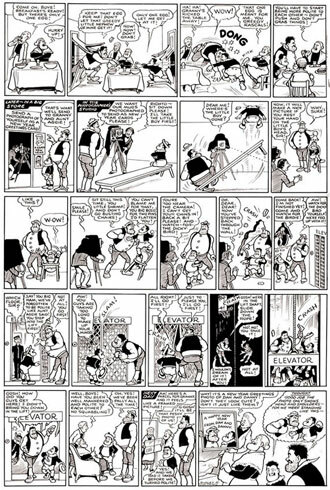 So Wullie has this rare idea, 'I ken whit we'll dae, Bob, we'll evacuate oorsel's!' They soon get a lift to a hoose where a farmer lives, shinin' his boots, makin' the fire an preparin' the brekka. The farmer wants to send them back hame, but they do such a good job they're promoted to makin' hay (whilst the sun shines on two happy pals on buckets in the last panel). 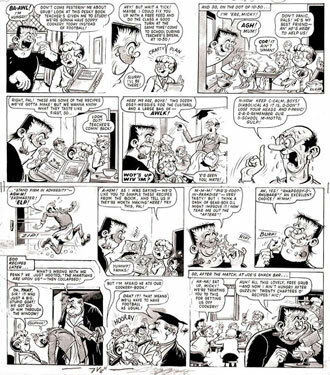 Wullie, War and Watkins at their alliterative best. The artwork was repatriated for £820. 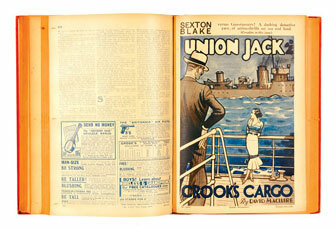 As our Sexton Blake Library collection continues to unwind our buyers are also bidding more strongly for The Union Jack title, all bound in publisher's file copies and containing Sexton Blake stories throughout. The above illustrated issues made £440 for 35 SBL copies from 1920-21 and £314 for the Union Jack complete year of 1932 respectively. Aunt Aggy and Granny have to separate Dan and his warring nephew, Danny and get them to be nice to each other at the studio for their 1949 New Year photies. Of course they tear the place apart and then make up whilst hurtling down the lift shaft, 'After you…No, after you..'[CRASH]. 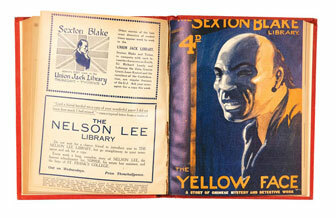 This piece was secured for £550 after a two year wait by the successful bidder, a London taxi driver. Quite a role reversal to find a cabbie chasing someone desperate. 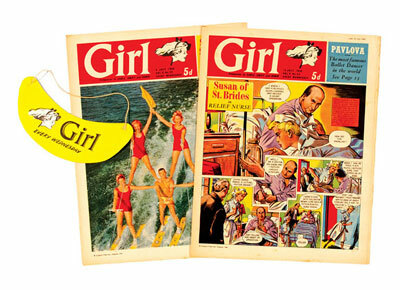 As usual the Girls' got in on the act and a complete run of volumes 1-10, offered year by year in varying grades, made £1,434, well above estimate. Their lady owner was delighted and couldn't wait to tell her brother, who had thrown out all of his Eagles in the 70s. 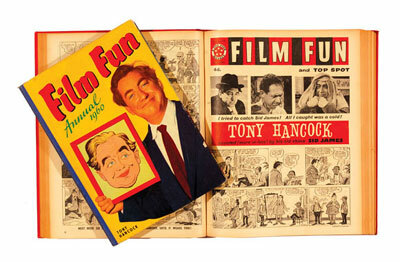 The 1960s featured strongly in this catalogue with the star lot a complete year of Film Fun in three bound volumes with the matching annual. £440 put this lot in to Top Spot (a title that was amalgamated into Film Fun that January). 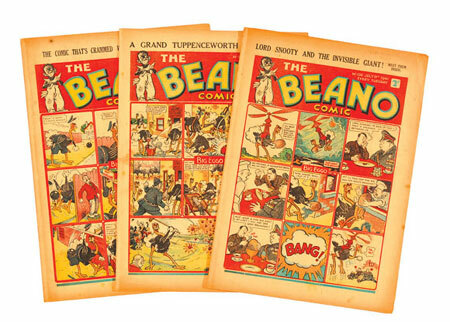 Dandy and Beano from 1960 - 64 are also rarer than their Fifties counterparts as the print run during those years was lower, a fact due in part to the success of stablemates Beezer and Topper, whose large format, fresher approach was capturing larger chunks of the same market readership. Prices for complete years of Dandy and Beano from these years averaged £5+ a copy in Fine grades. 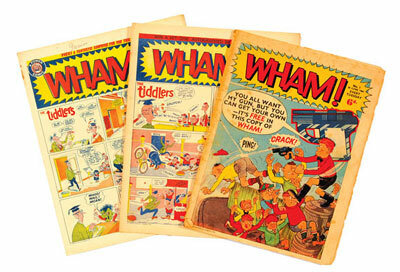 All 187 issues of WHAM! were offered in this lot with the first three issues well worn and some later rusty stapled copies. Bidding was nevertheless fierce and £610 was successfully tendered by one of our regular buyers, who snapped up the first 15 issues of POW! For £39 whilst he was at it. 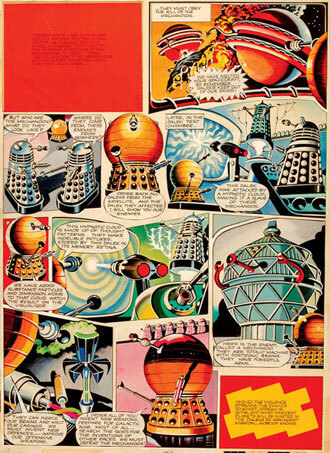 Here was Ron Turner's second artwork of The Daleks for TV Century 21 showing their continuing fight against the deadly Mechanoids. This magnificently drawn page exterminated £1550. 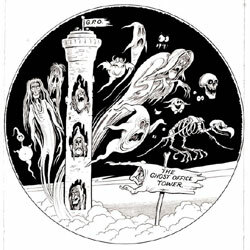 Ken Reid's work is also very popular and Frankie Stein's surreal episodes brilliantly written. In this episode he's hungry and the recipes in a cook book look so delicious - he eats the book. £385 also satisfied the winning bidder's appetite. 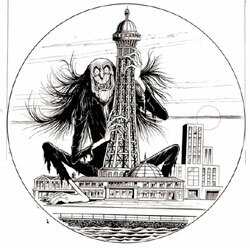 The punning artwork of The World Wide Weirdies in The Ghost Office Tower and Blackghoul Tower climbed to £165 a piece. 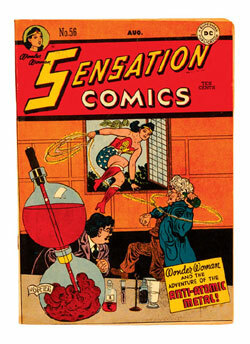 Our US section featured some higher grade affordable Golden Age issues, still enjoying firm American interest. Flash #80 in Very fine Grade made £160, Sensation #56 with H G Peter's iconic Wonder Woman cover lassoed £56 and Superboy #15 flew out at £60. 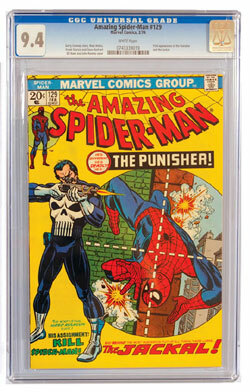 Our pence copy of Amazing Spider-Man #3 in VFN was bid to £550, and the CGC copies of #28 and Punisher's #129 reached £457 and £335 respectively. 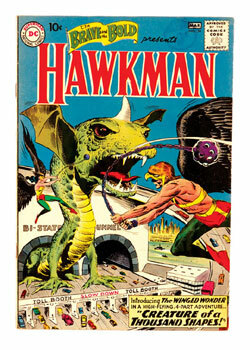 Brave And The Bold #34 highlighted the first appearance of The Hawkman and in Fine Minus, a mid estimate £137 carried him away. Back to life with those Lions; If you've ever read the comics, you take as read the low grade paper stock they were printed on and the inevitable rusty staples (often to the point of disintegration) that held them together. 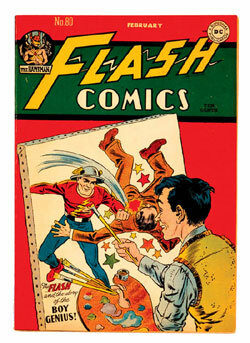 Lion was a budget version of Eagle which was published by Amalgamated Press in 1952 in response to that comic's huge popularity. But even the stirling efforts of Frank S Pepper and Ronald Forbes were hardly original, given that their brief was to emulate the extra-terrestrial exploits of a certain Colonel Dan McGregor Dare. What they finally came up with might better have been named Captain Clonedor. 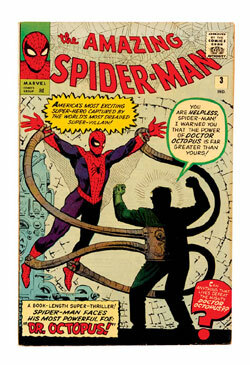 We experienced both extremes of bidding with this title in the June catalogue. Issue 1 with free gifts for 1 and 2 was taken to a strong £121 and we then offered numbers 6 - 14 individually to give everyone a chance to add these rarer early copies to their collections at the reasonable estimate of £10 - 15 apiece. Not a soul was interested until a canny Canadian swept up the lot for £6-8 each, the stratospheric Captain Condor falling uncertainly back to earth. 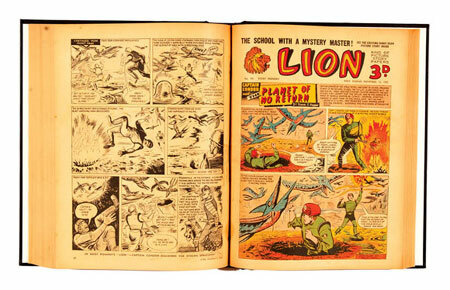 Further on we offered The Lion complete 1955 year, issues 150-202, only to see The Captain embark once more, this time into space's outer reaches with a staggering £715. That's why I'm in this business, I love comics in general, artwork in particular and the vibrancy of our whole auction process. I'm also sure in the knowledge of one of the world's greatest financial speculators, George Soros, who said that nobody knows anything.